Households living by Tonle Sap lake have increased their consumption of small fish, which is packed with micronutrients vital for good health and child development. 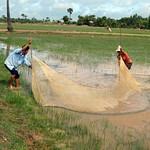 Nutrient-rich small fish such as the Mekong flying barb, yellow tail rasbora, and slender rasbora are abundant in the flooded rice fields, rivers and streams that cover the Cambodian countryside. But a common perception among households, 80% of whom engage in fishing, is that these wild-caught fish are most useful for feeding to pigs, ducks and chickens. “My household would catch small fish from rice fields, canals, streams, lakes, and ponds, but we’d rarely eat them,” explains Chum Dany from Aren village, Pursat province. “The elderly people in my village would tell us that feeding small fish to children makes them thin and susceptible to illness,” he says. In fact, small fish, when eaten whole, have many nutritional benefits because they are rich in vitamin A, zinc, iron and calcium, which are needed for cognitive and physical development, especially in children. 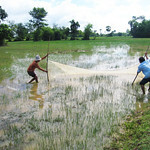 To encourage greater consumption of wild-caught small fish in Cambodia, where 40% of children under five are malnourished, the USAID-funded Enhancing Rice Field Fisheries project ran an awareness campaign promoting the importance and nutritional benefits of small fish from 2012 to 2016. Activities included trainings, cooking demonstrations and household coaching. The project targeted community members, commune leaders and secondary school students in four provinces surrounding Tonle Sap lake, where many households depend on fishing in rice-fields for food and income. The campaign led to increased at-home consumption of small fish by 13% on average from 2012 to 2016, and boosted consumption of small fish by children under five by 23% among households in the project target areas. As part of the campaign, project staff held half-day trainings frequently. Participants learned about the nutritional benefits of small fish, how to process them and recipes to maximize nutritional value. Mothers, with primary responsibility for the household grocery shopping and cooking, were a key target. “I didn’t know small fish were so nutritious,” says mother Van Vy, from Aren village, Pursat province. Despite 53% of a small fish’s vitamin A value coming from the eyes and head, it is common practice in Cambodia to remove these before cooking. “At first I was hesitant to change the way I processed and cooked the fish. But slowly, after attending many trainings and getting help from the project team and local NGOs, I adopted the new and better ways,” she says. The increased consumption of fish, already the country’s second most consumed food after rice, is helping improve nutrition in Cambodia. As part of the training, participants also learned how to process small fish into a fish powder, which they can store for use during the lean season, the months when households are not able to catch fish at all. “We rarely ate small fish because we did not know how to process and store it. But now we use the small fish powder to eat with rice or porridge,” explains Van Vy. “My children, especially my four year old, love the taste,” she says. In a typical Cambodian household, the eldest children are often involved in preparing food and meals for their younger siblings. The project therefore ran school education programs for youth in grades 8 – 11, including showing a Khmer-language short film. During the four-year project, over 58 events at schools were held, reaching 4,047 participants. Overall, 356 awareness-raising events were held as part of the campaign, reaching 16,491 individuals (53% women). A project survey found that 94% of households interviewed have adopted what they learned from the training and information materials such as feeding small fish to their children. In Phase II of the project (2016-2021), which builds on Phase I (2012-2016), nutrition activities will be expanded to include vegetable farming. 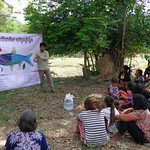 Households will receive training on growing vegetables such as amaranth, morning glory, cucumber, tomato and string bean around their fish refuge ponds, if located close to their houses within the rice field. Small fish are widely available to catch from the rivers or buy at affordable prices from local markets. By increasing consumption of small fish, families are boosting their nutrient intake and giving their children the best start to life.